The History of 2 Bay View Street | The New England Real Estate Co.
"It first started as a bank..."
Main Street Camden, looking North in 1875. Notice the 2 Bay View Street building in the lower right. The 2 Bay View Street building was built in 1833 and first started as a bank, as evidenced from the original ‘teller windows’ still in place today. Known for its iconic curved front and curved windows, the building housed a safe that is long gone but the heart of the space remains. Just a short period later, the building was owned by Joseph W. Bowers and called the ‘J. W. Bowers’ Plumbing Co. 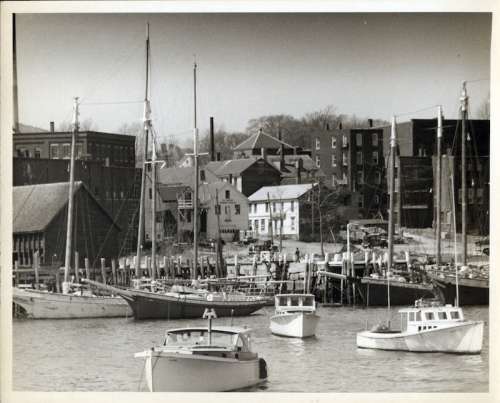 The shop was known locally for selling a number of items including supplies for the ship chandlers’ in port, fisherman’s outfits, plumbing supplies, sailing provisions, kitchen & woodenwares, and a tinsmith. 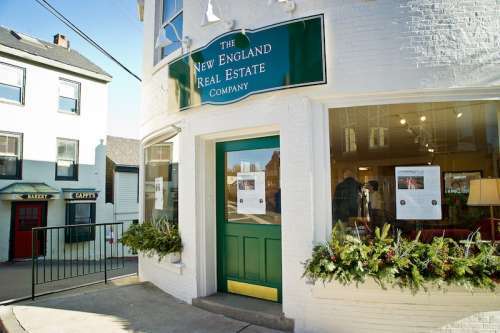 The space also housed a steamboat agent’s office and a small fish market off the harbor. At the time Mr. Bowers owned the building it was known as the ‘Jones Block’. By 1931, it was owned by Albert H. Parsons, who was also a plumber and renamed the business to the ‘A. H. Parsons’ Plumbing Supply Co. Mr. Parsons retired in 1947. It remained this name well into the late 50’s and then changed to the ‘F. L. Spears’ Plumbing and Heating Co. At this time the building was referred to as the ‘Spears Block’. Years later, the building was sold once again and became the ‘Hamilton’ Plumbing Co. In 1971, Betty and Jack Frost purchased the building. "...And was built like a boat!" 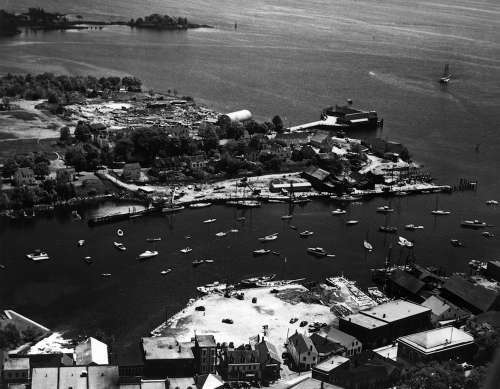 Aerial view of the Camden Harbor in 1946. In many ways, the building was built like a boat, given its distinctive curved front shape, unusual offset architectural style and its large oversized curved front windows. 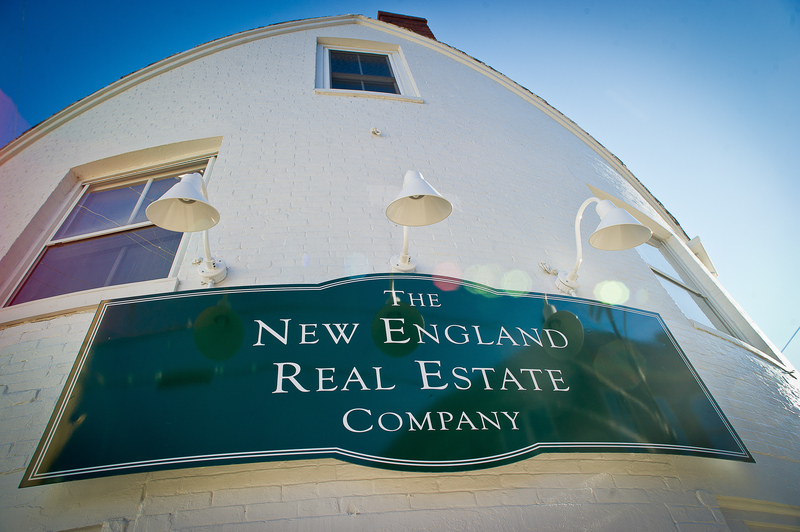 The building survived the great fire of 1892 where the winds were known to be coming out of the Northeast and carried the fire up Elm Street. Years later, the building also survived the harbor fire of 1935 where fortunately the winds were blowing in the opposite direction out of the Northwest toward the harbor. In both cases the building was spared from the devastation of each fire. During an economic boom in shipbuilding, then bust, then boom again, and eventually a harbor landing waterfront redevelopment, the building has remained. She sits proudly at the head of Bay View Street and on the corner of what was known at the turn of the century as the ‘Corner of Bay View and Commercial Streets’. Inside, a 3 story floor industrial elevator was used for many years by the plumbing supply companies and still is in place today. 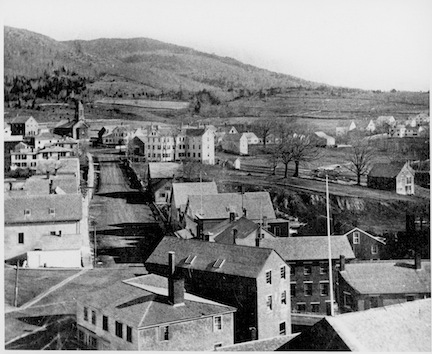 Overlooking the Camden Harbor sometime between 1920 and 1930. Notice the garage door where Maine Sport started. The building has had many successful businesses over the years including ‘The Jack Frost Shop’, which first opened in February 1972 and was soon robbed of $31,000 worth of coins and rare stamps right after it opened. 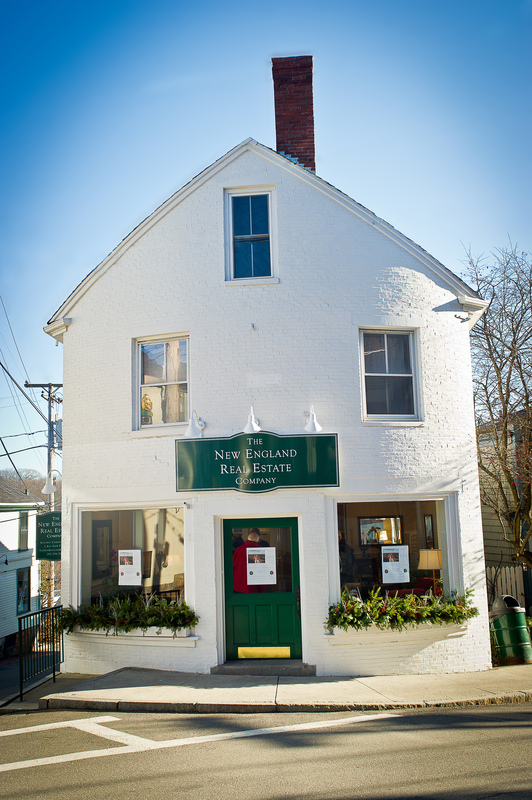 The shop was well known for their antiques, post cards, coins, artwork and Maine made items. Later in the mid 70’s, ‘Maine Sport’s’ first location opened up for business in the dead of winter, selling bikes and kayaks out of the garage space downstairs. ‘The ‘Canvas Bag Shop’ opened and sold its goods out of the side entrance on Commercial Street each summer. Later, the well loved ‘Unique One’ sweater and yarn store operated out of the main floor for many years till 2009. 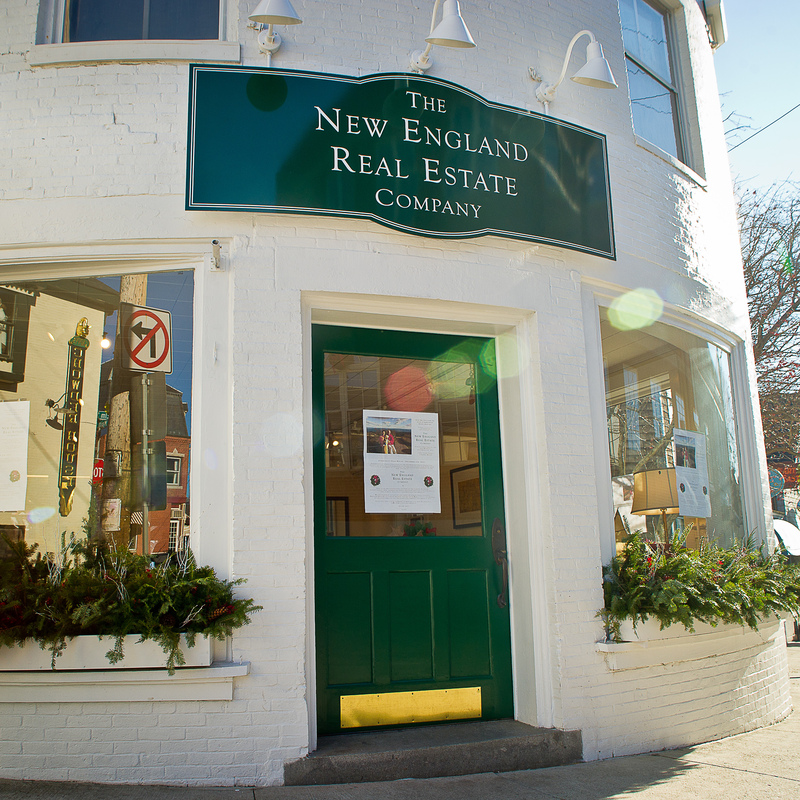 Today, the ‘Small Wonder’ art gallery, now in its 28th year of business and ‘The New England Real Estate Company’ both operate out of the historic 2 Bay View Street building. 2 Bay View Street Today.